Is there any relationship between the distribution of national income between capital and labour – factor shares, functional income distribution – and income inequality in terms of personal income distribution? Very broadly, there are two types of income distribution. So-called functional income distribution concerns the distribution of national income between classes, according to income types: employees, capital owners, and maybe the self-employed as a group of its own. The more commonly used definition is personal income distribution: the distribution of incomes between individuals, no matter the type of income. This distribution may be measured by Gini coefficients, top income shares or some other measure. Functional income distribution is measured by wage shares and capital shares of national income. There is certainly no agreement about the relationship between distributional and functional income in the literature. The latest major formulation of the argument that functional income distribution does affect the personal income distribution has been made by Thomas Piketty (2014) in his book Capital in the Twenty-First Century. Piketty argues that inequality of income from capital is higher than inequality of labor income, and thus when capital incomes increase relative to labor incomes, total income inequality increases. On the other hand, critics of the book have argued that the distribution between wage shares and capital shares is an old-fashioned thing (for example Lindert 2014, p. 5) and that the key aspect of inequality is really the distribution of wages. 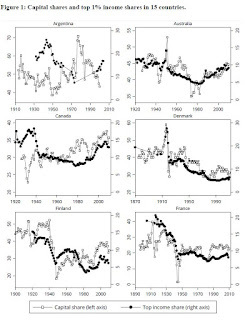 We use our data to look for common trends, asking questions such as if other countries experienced periods akin to the “Engels’ Pause” found by Allen (2009) for Britain in the early industrialization period or if most countries exhibit wage moderation in the postwar period as argued by for example Eichengreen (2007). 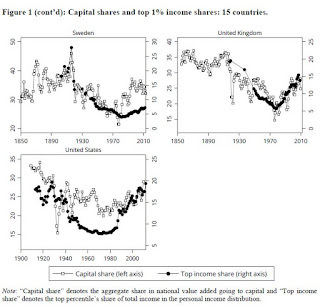 But our main focus is not on the movements of capital shares per se, but rather their relationship with personal income inequality, measured especially with top income shares but also, as robustness checks, with Gini coefficients. Our empirical assessment of the link between capital shares and top income shares is based on panel regressions. Our main focus is the unconditional correlation between the capital share and personal income inequality, so in our main estimations we do not include control variables. (We do include country fixed effects in the panel setting.) In further estimations we include control variables such as GDP per capita, employment share in agriculture, stock market capitalization, and central government spending. 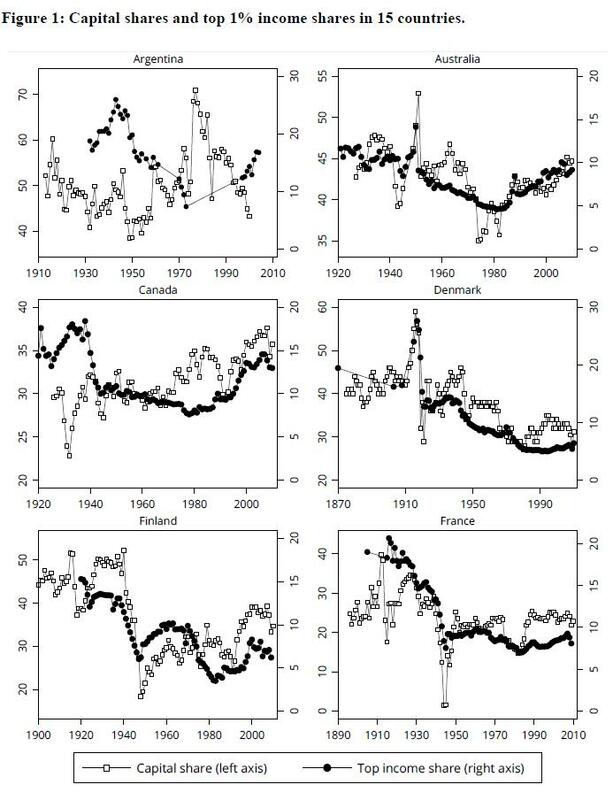 We also look at the correlation between capital share and inequality in specific groups of countries as well as broken up by time period (pre-WW1, interwar period, postwar period, post-1980 period). Among the 15 countries where we have capital share data and top incomes data, in 13 there is the expected positive correlation between capital share and top percentile share. In 11 of the countries the correlation is stronger than 0.55. 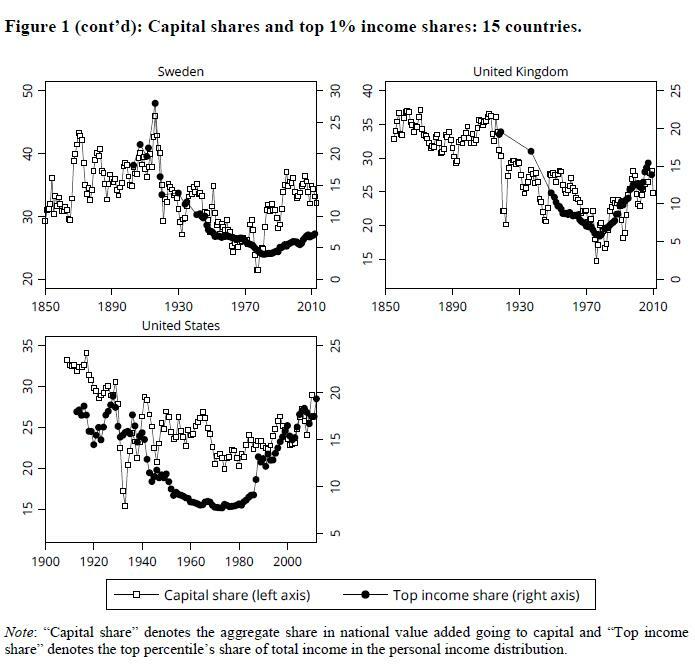 When we move to the panel regression approach, the results also indicate a strong relationship between capital shares and inequality. 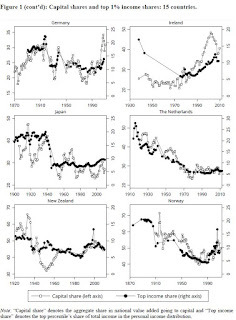 In panel regression without control variables, the correlation between capital share and top percentile share with annual data is 0.86 and using five-year averages it is 1.36. The correlation is lower before WW2 and in the early postwar period and stronger after 1980. The correlation is stronger in the Nordic countries than in Anglo-Saxon countries, in accordance with previous literature which has emphasized the role of capital incomes in rising income inequality to a higher degree for the Nordic countries than in for example the US. (See Roine and Waldenström 2012.) The correlation is still strong when including control variables (at its lowest 0.62 in the panel setting). The correlation holds when using the Gini coefficient as inequality measure instead of top income shares. 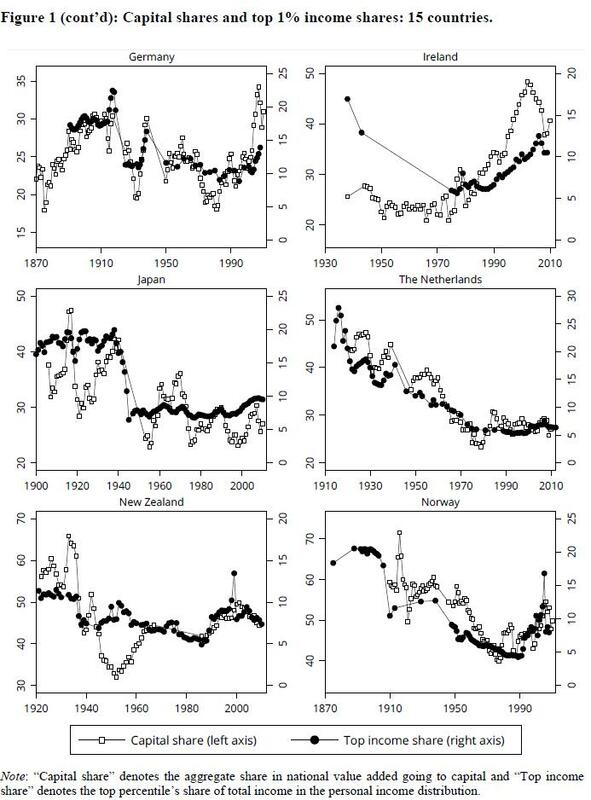 Lindert, Peter (2014) “Making the Most of Capital in the 21st Century”, NBER Working Paper No. 20232, June 2014 (Cambridge, MA: NBER). Piketty, Thomas and Gabriel Zucman (2014) “Capital Is Back: Wealth-Income Ratios in Rich Countries, 1700–2010”, Quarterly Journal of Economics 129(3): 1255–1310. 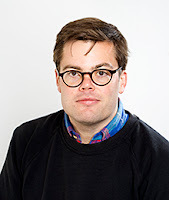 Roine, Jesper and Daniel Waldenström (2012) “On the Role of Capital Gains in Swedish Income Inequality”, Review of Income and Wealth 58(3): 569–587.